Moving in New York draws it all out of you. It drains your bank account. It tires your muscles. It confronts you with old memories and fills you with doubt. It forces you in to a new routine. I moved this past weekend and I am exhausted. First, there was packing and wrapping things up at my old place. Now, I feel like I’ve been unpacking for days but haven’t made any progress. I’m ready for it to be over. I’m ready to feel settled. But while moving in New York draws it all out of you, the effects of this move are already starting to refuel me. Even the moving process itself was refreshing – well, maybe not refreshing, but encouraging. My dad flew in to help me move, which relieved some of the stress of hiring movers (knowing I could leave some items out of boxes, make an extra trip to the old place if need be, etc. ), and gave me the chance to spend a whole weekend with him. I knew one of my roommates would be moving at the same time, and one of our friends was helping her, so I figured the four of us would tag-team. We did, but we had even more help from some friends who all work at our church. They get Fridays off and chose to spend part of it lugging our boxes and chairs and suitcases and side tables. That was incredible to me. I feel like, in church circles, it’s easy to talk about doing good things for other people or lightening the load for your friends. To be in a community where people walk that talk…that’s why I love Redeemer. I’m trying to look on the bright side of unpacking. It’s a chance to purge even more stuff than I did when I packed it the first time. It’s an excuse to watch my favorite old movies (because it’s too hard to multitask and concentrate on following a new movie while you unpack) and peruse Pinterest for decor ideas (I’m looking for a great print to hang on my empty wall…currently leaning to something that involves Bill Murray and/or The Royal Tenenbaums). Another bright side of moving was having my dad in town. I hadn’t seen him since March, so it was great to catch up, introduce him to my friends and show him my side of the city. We also took one history nerd adventure, to Green-Wood Cemetery in Brooklyn, which was really awesome. I always thought it sounded interesting – tons of famous and famous-in-New-York people are buried there – but never went since it was too far away or too confusing to navigate or whatever. It’s a doable trip by subway, and my dad bought a cheap app that told stories about notable people and graves. Sounds morbid, but it was super interesting, and added an element we wouldn’t have had if we’d wandered mindlessly. So for now I may be sitting amidst a maze of half-opened boxes and my brain might be a little fried from the adjustment, but the process of getting here was worth all the exhaustion. Until everything finds its place, I will savor life on the Upper West Side, a killer view of Central Park and the east side from my bedroom window, and a breezy commute to work on the 2/3 express trains. Here’s to seeing life in New York from a different angle. It’s 2 a.m. on Saturday morning (in New York, anyway; the time zone thing messes me up occasionally. I realized a few weeks ago that, had I been born at the exact same moment on the east coast as I was on the west coast, I would have a different birthday. Blew my mind for a moment. ), and I should be sleeping. 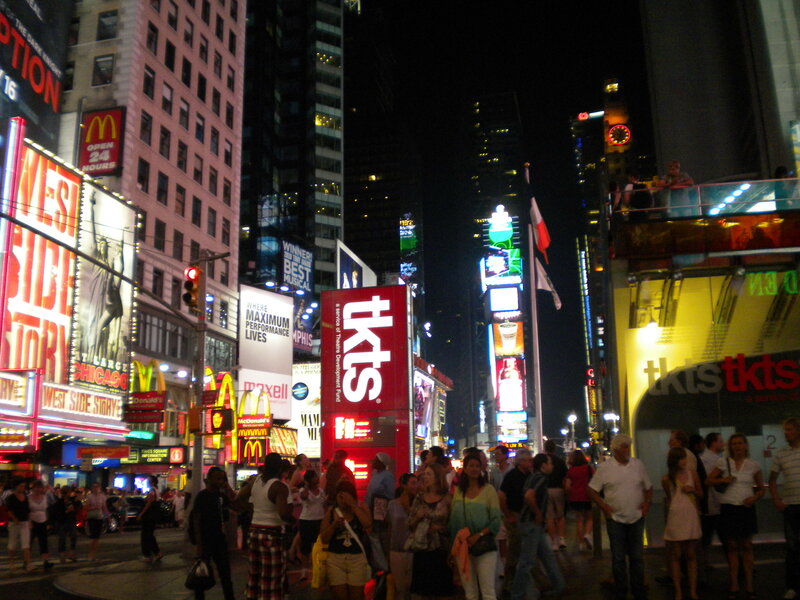 But, since I’m suddenly feeling inspired, I decided to write about my Friday night in Times Square. Locals generally turn up their noses at Times Square, it seems, because it’s crammed with tourists, smells kind of bad, and is very commercial. No one has actually given me those three exact reasons, except for the tourists part, but I’m guessing they all play a role. And, since I’m trying to be as local as possible, I felt a little guilty for spending Friday night either in Times Square or at the nearby St. James Theatre, where a friend and I saw the Broadway production of “American Idiot.” The show “follows the exhilarating journey of a new generation of young Americans as they struggle to find meaning in a post-9/11 world, borne along by Green Day’s electrifying score,” per Broadway.com. That’s an accurate description. My friend Emily (right) and I at the St. James Theater to see "American Idiot." 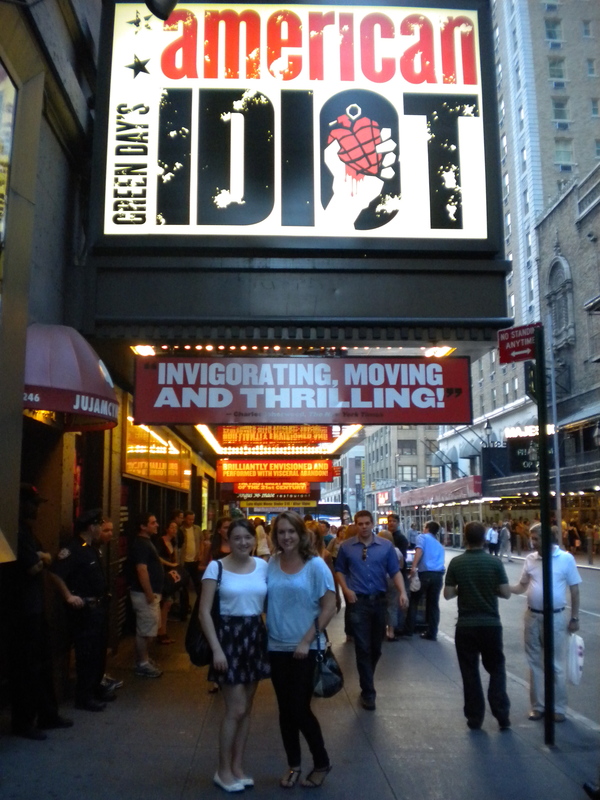 If you’re into soul-searching, rock music and skinny jeans, you would love American Idiot. And even if you’re not, you’d enjoy it simply because the sets are spectacular, the performers have great singing voices (there are few spoken lines in the show) and because there is a thought-provoking storyline woven through all of the songs. While spending an hour and a half in the presence of outrageously loud and upbeat music was pretty electrifying, there is nothing quite like being right in Times Square. You truly feel like you are at the center of the universe and that you have your finger on the pulse of everything that makes the world go ‘round: bright lights, sounds, smells, a smattering of people from all over the globe – and of course, huge billboards and American Eagle. The intersection of everything in the world. I worry sometimes that living here for an extended period of time is causing the city to lose some of its luster in my eyes – when you see the Empire State Building nearly every day, it’s not quite as exciting as it is when you see it for the first time. But, spending an evening in Times Square reminded me that the bright lights and electrifying feeling of the city could never be entirely eliminated. It is New York, after all. 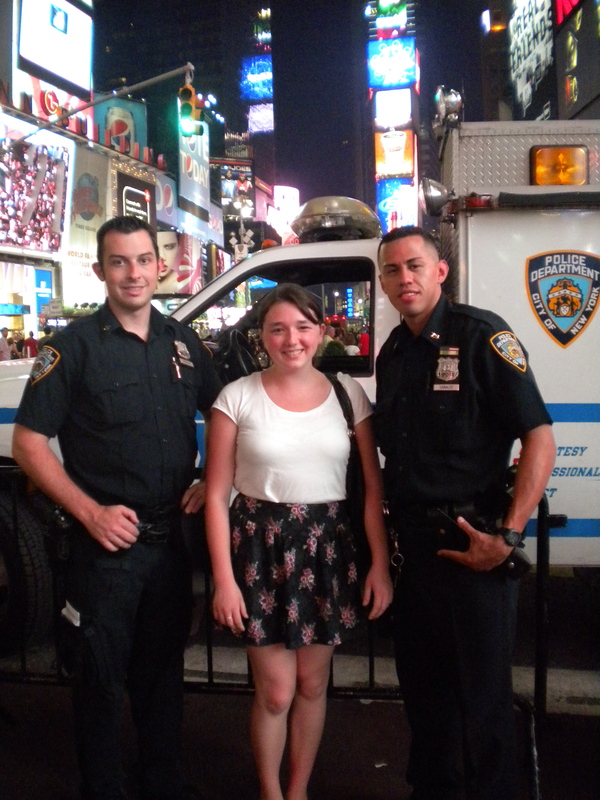 And all sappiness about the meaning of Times Square aside, you can take your picture with NYPD officers there. That in and of itself is enough to make Times Square cool. A week ago, I was cramming for finals. 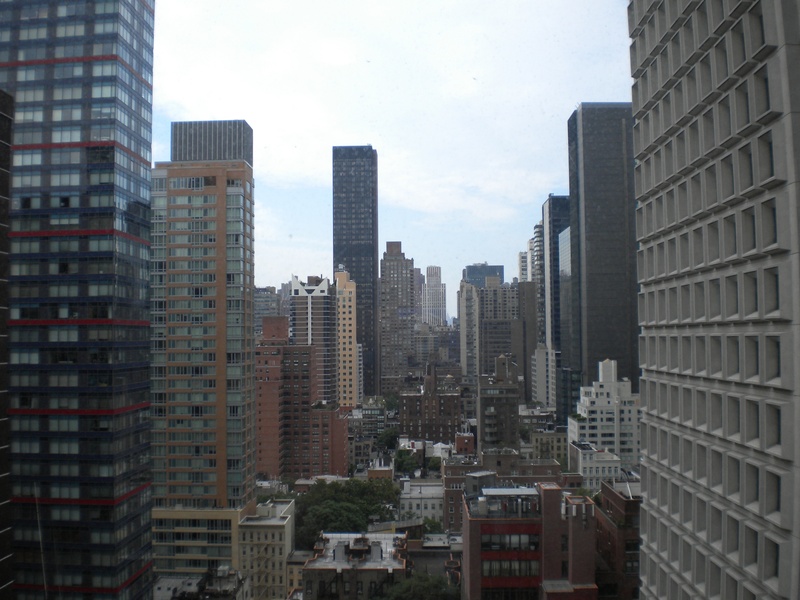 Now, I’m staring out at a bunch of tall buildings in New York. The last few days have been crazy to say the least. On Friday morning, I officially finished my sophomore year of college. That was enough to make it a pretty cool day, but later that night my dad and I hopped on a redeye from PDX to JFK and arrived in New York City on Sunday morning. 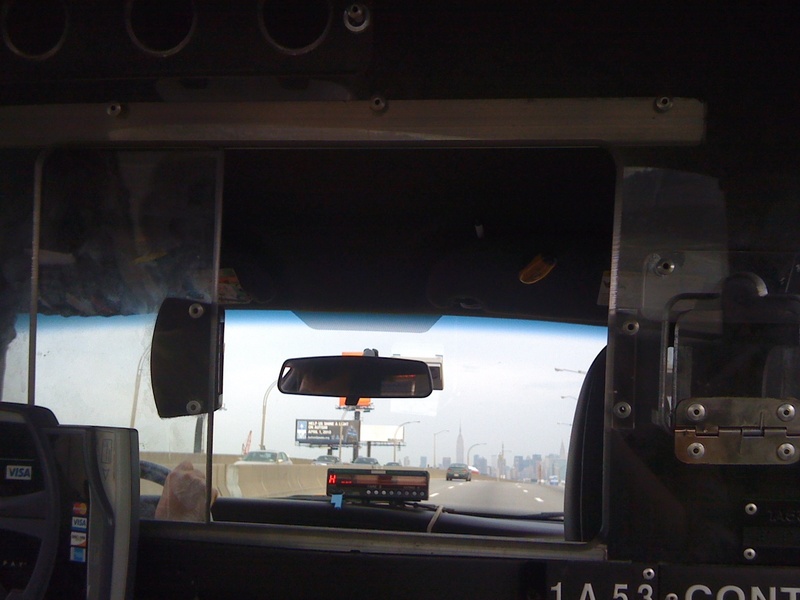 Armed with coffee (thank you, Dunkin’ Donuts), we hopped in a cab and rode into the city. The New York skyline is breathtaking and I couldn’t wait to see it. Even thought I’ve seen it before, this was the best time; everything looked so HUGE. Well, obviously, it is huge, but you get the idea. I took this picture from the back of our cab. The Empire State Building is in the distance. As I stared at it, it began to sink in that I was actually going to be living there for ten weeks. Of course, I’ve known this since April, so you’d think it would have sunk in earlier, but seeing the city for the first time really made it seem real. After some stealth backing-up-in-the-middle-of-the-street maneuvers by our cab driver, we arrived at the dorm where I’ll be staying this summer. We did a bit of unpacking and then headed out to test-run my walk to work and grab a few things at Bed, Bath and Beyond. To get a sense of a trip to BB&B in a big city, just imagine my father and I trekking up several blocks with massive plastic bags in our arms, hangers and small ironing boards poking out at all angles. The view from my dorm room, on the 21st floor of the building. 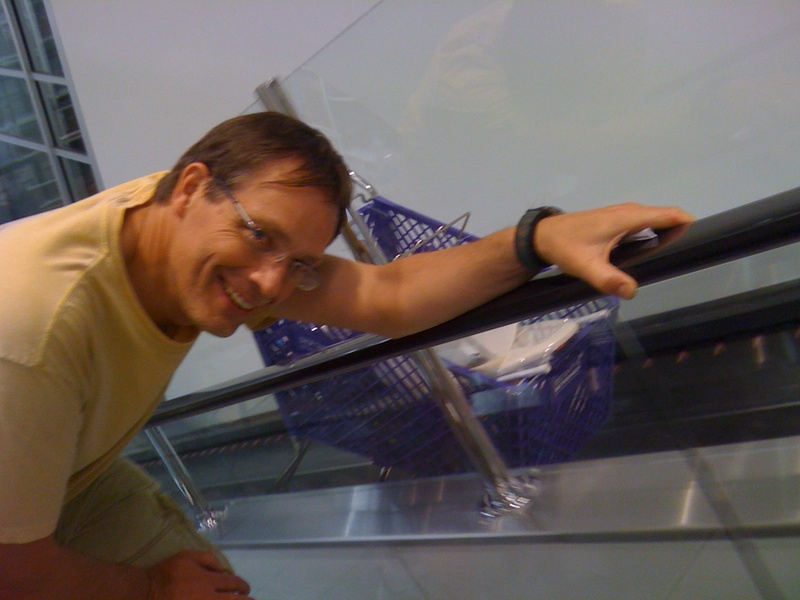 And yes, it’s dorky, but I made my dad pose with the AWESOME cart escalator at Bed, Bath and Beyond. Because it has three floors and you can’t take a cart with you up the escalator, they had a little contraption that took your cart up on its own. These are probably commonplace for New Yorkers, but I was amazed. My dad, on the human escalator, poses with our cart on the cart escalator. That evening, we saw West Side Story at the Palace Theater on Broadway, which was fantastic. 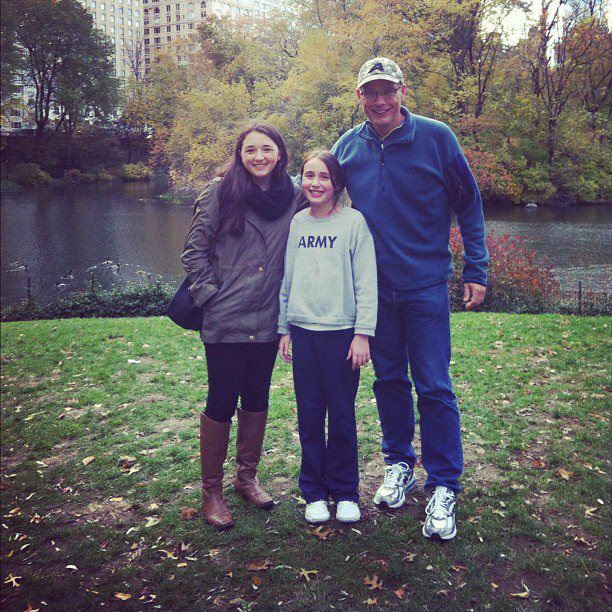 We also walked around the Rockefeller Plaza. 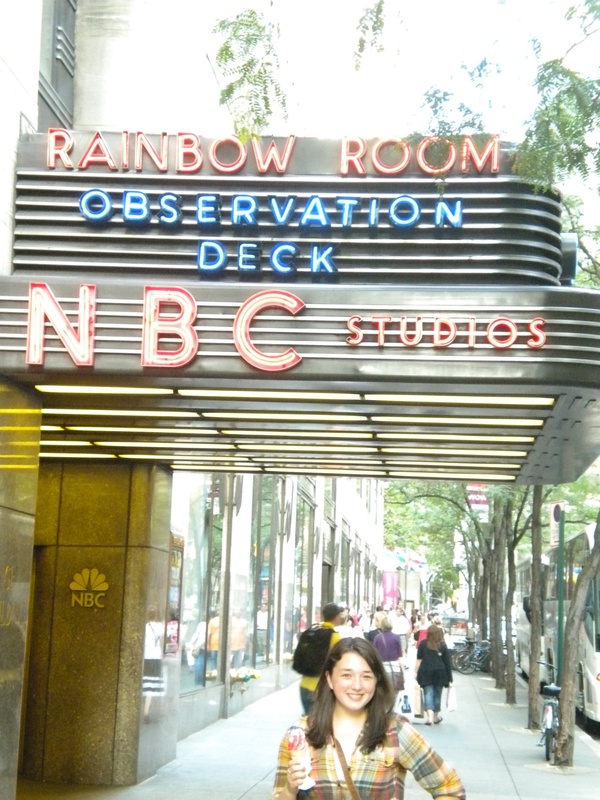 And even though it’s not a great picture, this is me in front of the entrance to 30 Rock (aka, where Liz Lemon walks into work every morning). This picture is a bit washed out, but this is where Liz Lemon goes to work! This is where Kenneth held his page strike! This is where the opening shots of 30 Rock are filmed! Still with me? Thank you. I’m getting pretty excited. This morning I began my internship at Rodale, Inc., a publishing firm that publishes health and wellness titles like Prevention, Men’s/Women’s Health and Runner’s World. I’m one of their corporate communications interns this summer, which will allow me to use and expand my public relations skills. 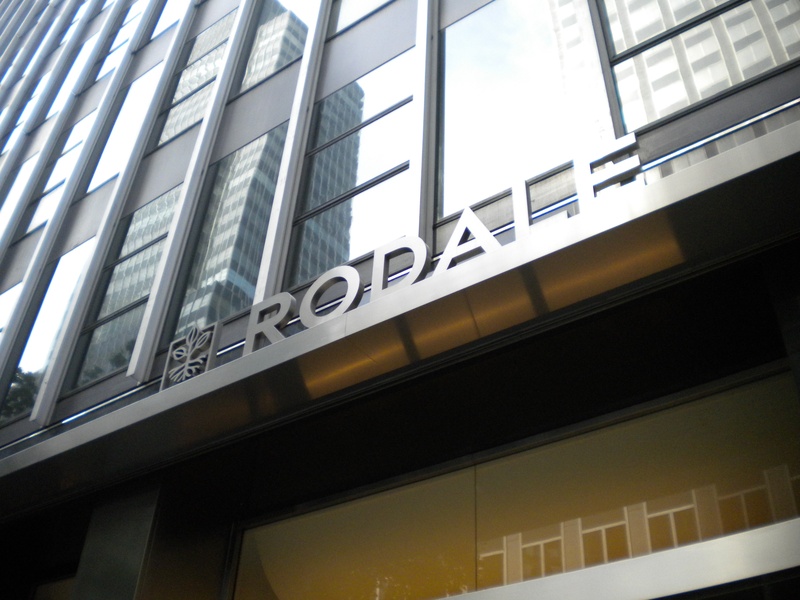 The very front of the Rodale office on 3rd Avenue. I'm on the 9th floor. I was nervous about starting because I haven’t had much real-world PR experience and the work I’ve done is more agency based (if you don’t know anything about public relations, it’s alright. I appreciate that you’re still reading, 528 words in.) This summer, I’ll be working with the PR teams for three magazine titles: Bicycling, Runner’s World and Organic Gardening. With the Tour de France starting soon, Bicycling will have a lot on their plates. I don’t know what I’m going to do every single day this summer, but so far I’ve been working on learning how to use Cision, a public relations tracking/monitoring software, getting acquainted with what topics those three titles typically cover and learning how they typically pitch media and organize their work. The public relations staff worked with at Rodale has been supportive and helpful! It’s been a great environment and I’m excited for the coming days. One thing I discovered is that I won’t really be around the other interns. There are interns working in many different departments, so we’re spread out throughout the building. Another corporate communications intern will be starting next Monday, so I’m looking forward to having another PR person with me! I was excited to find out that I get my very own cubicle, complete with my own work e-mail and phone extension. I have thumbtacks, Post-It notes and filing cabinets. So far today, I walked past my own cube roughly five or six times, twice got lost trying to find the bathroom twice and came home with 13 magazines to peruse and learn more about. 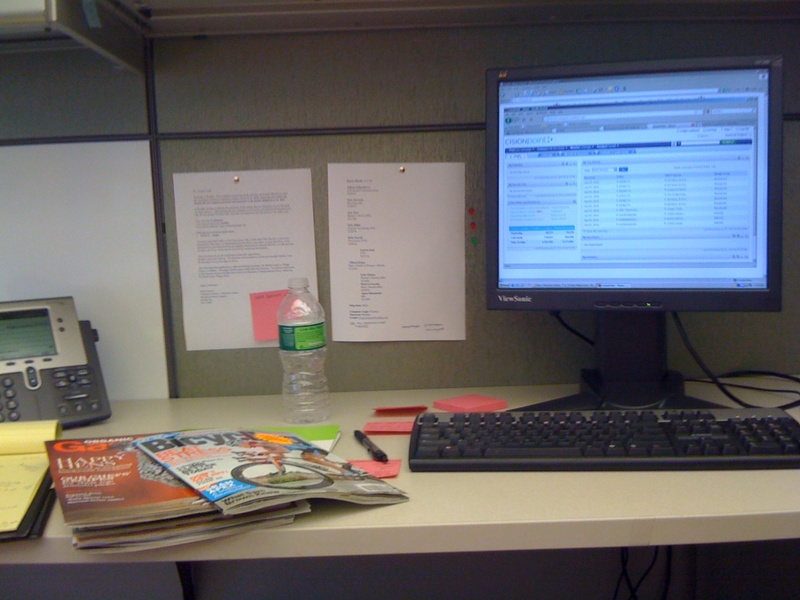 I'm hoping to get a wider shot (wow, this is like the fifth picture where I apologize for my amateur photography skills), but this is my cubicle at Rodale! Okay, I know that was long. Thank you for reading to the end. (Mom, I know that probably just means you.) I promise the rest of my posts won’t be so wordy…but hey, you probably only spend summer in New York once. Thanks again for reading and feel free to leave a comment! I’d love to hear from you.